A 7.0-magnitude earthquake shook Anchorage this morning, disrupting power and damaging roads. The tsunami warning that was in effect this morning has been cancelled. 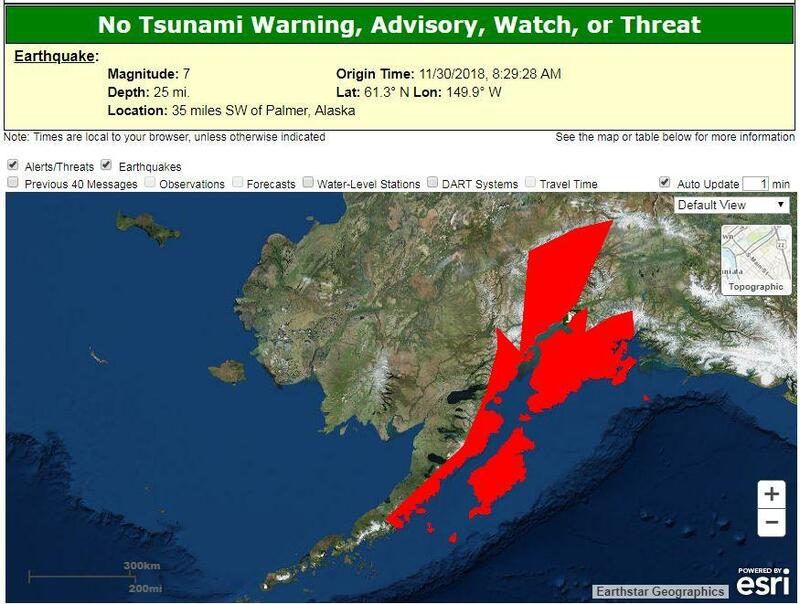 The U.S. Tsunami Warning System has cancelled the tsunami warning that was in effect for the east side of the Alaka Peninsula, Cook Inlet and the southern Kenai Peninsula. At 8:30 this morning a 7.0-magnitude earthquake shook Anchorage. A tsunami warning is in effect for the east side of the Alaska Peninsula, Cook Inlet and the southern Kenai Peninsula. The National Tsunami Warning Center cautions that tsunamis can travel hundreds of miles per hour, so residents of these areas should evacuate to high ground and stay away from beaches. This is a breaking news story, and KDLG will update this post as more information becomes available.